" Sail Turkey In Style " Cruises every week commencing in May and are usually Monday to Monday.Ideal way to explore the pristine coast of Turkey is by sailing on board luxury gulets with ensuite and air-conditioned cabins, enjoy also onboard the chef's traditional Turkish and Mediterranean cooking. One Week Cruise - Marmaris - Ekincik (Dalyan/Kaunos) - Manastir - Tersane - Fethiye - Oludeniz - Gemiler Adasi - Gocek. One Week Cruise - Marmaris - Kadirga - Serce - Bozzukkale - Bozburun - Selimyie - Ciftlek - Bencik - Datca - Hisaronu - Marmaris. Depending on your itinerary you will set off after breakfast two different places before anchoring for the night, either in a small village, a lively town or in a secluded bay. Our experinced Captains will find the best and safest anchorages and will keep you informed abou local places of interest. 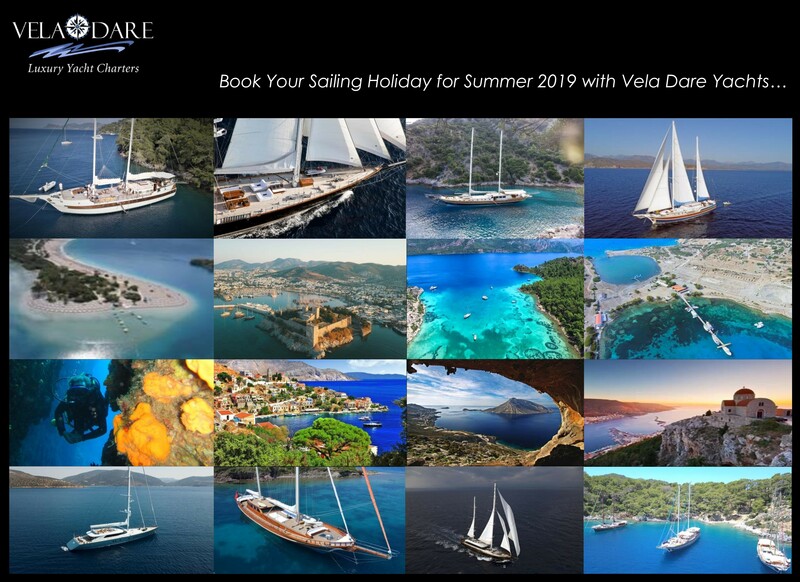 Luxury Vela Dare Yachts, all with ensuite bathrooms, experienced skippers, chefs and deck hand(s). Yachts cruise with motor & under sail, weather and time permitting. All harbour dues in Turkish waters. Sharing double cabins (some of our yachts have twin beds in the cabins, please ask at time of booking). Full board, lunches, dinners - including seafood dinners and five o'clock tea, bottled water with meals, tea & coffee with breakfast. Services of the crew. Air-conditioning runs in the mornings to chill the rooms when the morning sun warms up the cabins and in the evenings after dinner,the system is switched-off after mid-night. Bar bills for all sorts of drinks consumed onboard , International flights, visa for Turkey, gratuities for the crew, drinks other than those included, medical services, phone calls etc. Transfers from/to Marmaris /Dalaman Airport. One way 1-3 pax is GBP 40, 4-12 pax plus £ 60. For further inquiries you may have please call us or send an e-mail.